The Northwest Fork Hundred was settled in colonial times as a prime farming district. Small villages characterized the area. The largest community in the district, Bridgeville, was located south of Greenwood. The original village was St. Johnstown, located less than 1 mile east of from the current Town of Greenwood. 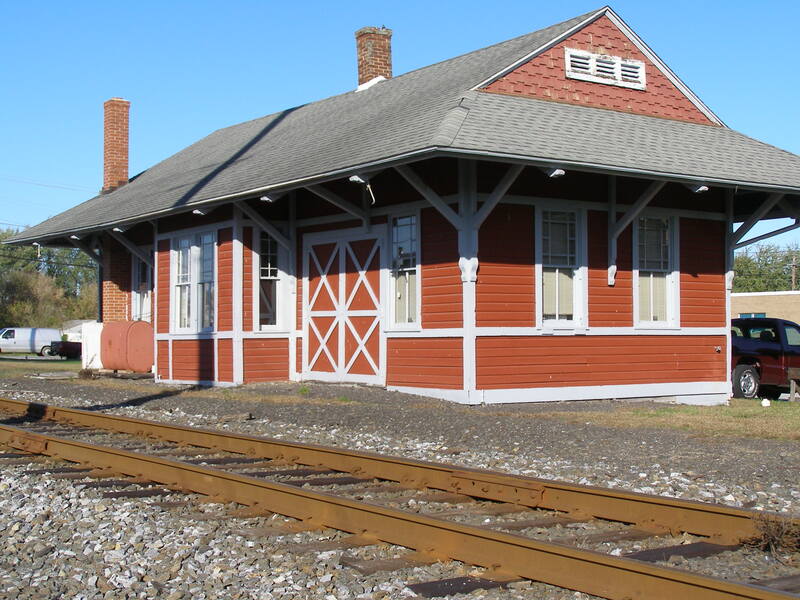 In 1858, the Delaware Railroad was completed through Northwest Fork Hundred and the Greenwood station and town were laid out on lands owned by Simeon Pennewell. Pennewell’s original plan included the east-west Market Street, and to the north, Minor Street, as well as the cross streets of Beaver, Church and Maple. Maple was later renamed Broad Street. The 1868 Atlas of Delaware shows Greenwood organized around the railroad with a train depot, general store, hotel and residences within a few blocks of the track. Pennewell’s son, Simeon Selby Pennewell, was born near Greenwood in 1867 and served as the 55th Governor of Delaware, from 1909 to 1913. Historical sources list 1858 as the founding date for Greenwood. The Town’s Charter was first enacted in 1901 and the Town was reincorporated in 1987. 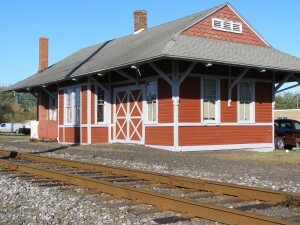 With the attraction of the railroad station, the Town of Greenwood rapidly became a market town and business center, while the original settlement of St. Johnstown declined and disappeared. The Town population was supported by a variety of businesses and industries including: agriculture, particularly orchards and row crops, general and specialty retail, a forge, a gristmill, a sawmill and a cannery (Scharf, 1888). A second railroad, the Maryland, Delaware and Virginia short line, ran east-west through town in the 1910′s. Although diversified, the Town of Greenwood has remained a small town. Population figures for the Town include: 1887 – 250 persons, 1910 – 362 persons and 1920 – 500 persons. In 1928, a fire destroyed a number of commercial buildings within the Town and provided the impetus to construct a water system with elevated water storage for fire protection. Greenwood had its beginnings with the coming of the Delaware railroad in 1856. A station was established at this point in 1858. In 1895 a new railroad, the Queen Anne, later known as the M. D. and V. intersected the Delaware railroad north of Minor Street. There were now seven trains each way daily on the Delaware road, and two each way on the Queen Anne. With such service, the wives of raiload men rode to Philadelphia or Baltimore using their ‘pass’ in the morning, shopped and returned home in time for supper. Even as late as 1920 the hotel was filled with salesmen waiting to catch the early morning train. 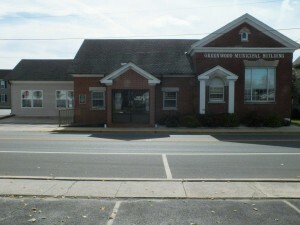 Greenwood Town Hall can be located on 100 West Market Street. This building was donated to the Town of Greenwood by Discover Bank. Discover Bank was founded in 1911 as a community bank in Greenwood, Delaware, under the name of Greenwood Trust Company and was renamed Discover Bank in 2000. In 1875 the small group of settlers in Greenwood decided that it was time to provide a school for its youth. A one room frame structure was built on the west side of Beaver Street, north of Minor. The school was upgraded, and the students progressed at their own pace until they had completed the program provided by the teacher, or they dropped out of school to work on farms or in the few industries located in the town. The curriculem consisted of reading, writing and arithmetic with a little history and geography for the older students. Between 1887 and 1912 two more classrooms were added and three high school grades were included in the educational program. The first class to graduate was the class of 1903. By 1915 it was again time for a larger school, and this time a more modern one. 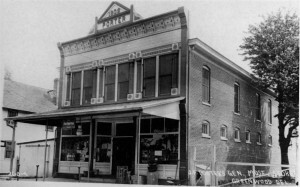 The third building was erected on the west side of Maryland Avenue. It was made of brick and consisted of six classrooms and a full basement which was later converted into two classrooms. By 1926 the rural districts began to consolidate with the Greenwood School. More classrooms were needed. In 1931 a referendum was held with resulted in the building of a modern Junior-Senior High School. 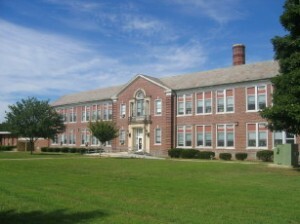 An Elementary wing, Field House, Cafeteria, Agrigulture and Wood Shop, and Library were added to this building at later dates. 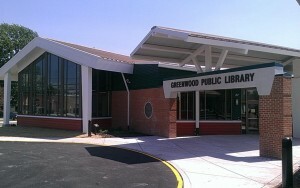 The Greenwood Public Library began in a loaned trailer in 1978. Ten years later, under the directorship of June Bostick, the Mill Street location was completed as a permanent home to a growing collection. By 1998, the library had grown so large that an addition was required. The addition was completed under the leadership of current director Pat Brown. Today, the Library is home to over 42,500 books, magazines, movies, and more! Practically every need could be satisfied in Greenwood around the year 1910. There was a barbershop, lumber mill, flour mill, livery stable, and eight general stores. One is shown in this picture. These supplied groceries, millinery, clothing, furiture, hardware, glassware, eye glasses, and fresh meat for the holidays.